On Friday, June 27th, 2009, the Grand Opening ceremony for Phase II of Ke Ala Hele Makalae was held at Lihi Park. Phase II consists of the 4-mile long multi-use path and associated ammenities that connect Lihi Park in Kapaa to Ahihi Point, north of Kealia Beach and Kuna Bay (aka Donkey Beach). Kahu Ipo Kahunaele-Ferreira blessed the path and encouraged residentsto "use the path with aloha." Dignitaries present at the event included Mayor Bernard Carvalho; Pat Phung, the Transportation Engineer for the Federal Highways Administration who has been our main contact representing the funding agency; and Brennon Morioka, Director of the State of Hawaii Department of Transportation Highways Division. Representative Mina Morita; Council members Kaipo Asing and Lani Kawahara; Director of Parks and Recreation Lenny Rapozo; Donald Fujimoto, County Engineer; Doug Haigh, Chief of the Building Division; and Marc Nishida, project manager for Jas W. Glover, Ltd all attended. About 100 people applauded as Mayor Carvalho recognized the many agencies, contractors, and individuals who contributed to the path's completion. While the Lihi Park to Kealia section of Phase II has been open for over a year, the entire Phase is now ready for public use now that cautionary and trail head signage is installed, protective fencing has been erected, and construction of the northern path section from Kealia Beach to Kuna Bay has concluded. 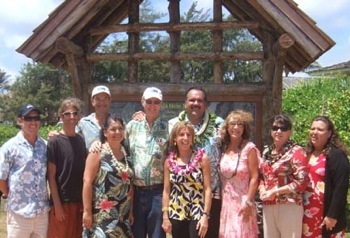 Kauai Path affiliates are shown in front of the trail head signage at Lihi Park with the Mayor, left to right: Ben Welborn, Mark Olson*, Randy Blake*, Kathy Leonard*, Thomas Noyes*, Bev Brody*, Mayor Carvalho, Michele Hughes, Christina Pilkington, and Theresa Koki (*Kauai Path Board Members). KAPA‘A — Grab a favorite pair of sneakers or put some air in the tires of that rusty, old bicycle, because Friday marked the official grand opening of Phase II for Ke Ala Hele Makalae — the path that goes by the coast. Individuals now have the opportunity to walk, bike or run 4.1 miles between the Lihi Boat Ramp in central Kapa‘a and Ahihi Point in Kealia, as well as traverse 2.5 miles through Lydgate Park. The Lydgate portion, known as Phase I, opened in 2003. The first two-odd miles of the Kapa‘a-to-Kealia section have been in use since early 2008, but the section north of Kealia Beach was not open to the general public until Friday. “This is truly an example of the community and government working together to make something happen,” said Mayor Bernard Carvalho Jr.
Noyes said the building of the path has been a collective effort between federal, state and county officials, as well as private donors, contractors and the community. Roughly 50 individuals involved with the project were there to celebrate the grand opening of Phase II Friday, where food was served and friendly exchanges were made. Pat Phung, lead highway engineer for the Federal Highway Administration’s Hawai‘i Division, was one such person who seemed excited about the path’s progress. "It has been the positive nature of the venture that has really kept it going," he said. Yet another example of the way Kaua‘i’s community pulls together to accomplish a task, Noyes — having been a part of the venture of some 15 years — said he is proud of the accomplishments thus far. “To have a third of the project complete is fantastic,” he said. When asked whether he was worried if current economic conditions might create a hindrance, Noyes said it has not been a concern, as he has seen many financial fluctuations throughout the years. “The economy comes and goes, but health and transportation needs are constant,” Noyes said, adding that since the Eastside pathway has been deemed such a success, interest has also “sparked” both North Shore and Westside communities, where efforts to emulate the project are currently underway. While Phases I and II are now complete, the two-mile stretch from Lydgate Park to Lihi Boat Ramp, including a spur to the Kapa‘a Elementary School area, that constitutes Phase III is currently under construction and is expected to be finished sometime next year. Phases IV, V and VI — which, when completed, will create an uninterrupted bridge between Anahola in the north to Nawiliwili in the south — are also well on the “path” to completion, with environmental assessments in progress. Noyes said he can’t think of a better place than Kaua‘i for such a project as Ke Ala Hele Makalae to take place. This is an island where recreational activities have the opportunity to flourish, given the ideal weather, the political will, and a healthy dose of community support, he said. Link to the story on the Mayor-A-Thon event at Ke Ala Hele Makalae.